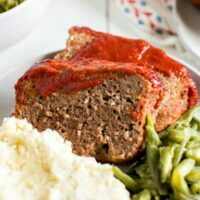 THIS IS THE ABSOLUTE BEST MEATLOAF RECIPE YOU COULD EVER HOPE TO HAVE…. ENJOY! In a large bowl, combine all of the ingredients for the meatloaf. Use your hands to mix together. Spray a bread pan with cooking oil and transfer the meat mixture to the pan, pressing it down evenly. In a small pan on the stove, combine all of the ingredients for the sauce. Bring to a boil and let simmer for 2-3 minutes. Adjust flavors accordingly. (If you don’t like a lot of spice, use less cayenne, if you want more chipotle, add more chipotle). Pour half a cup over the top of the meatloaf. Bake at 400 for 30 minutes. Remove from oven and add more sauce. Return to the oven and continue baking for another 45 minutes or until the internal temperature reaches 160 degrees.